Founded in October, 2001, the International Trade City District 1 is officially put into operation on 22 October, 2002 which occupies 420 Mu and a building area of 340,000 m2 with a total investment of 700 million. It is divided into five main business areas: subject of the market, manufacturer outlet center, shopping center, warehousing center and catering center. There are more than 9000 booths and over 10500 business entities in total. 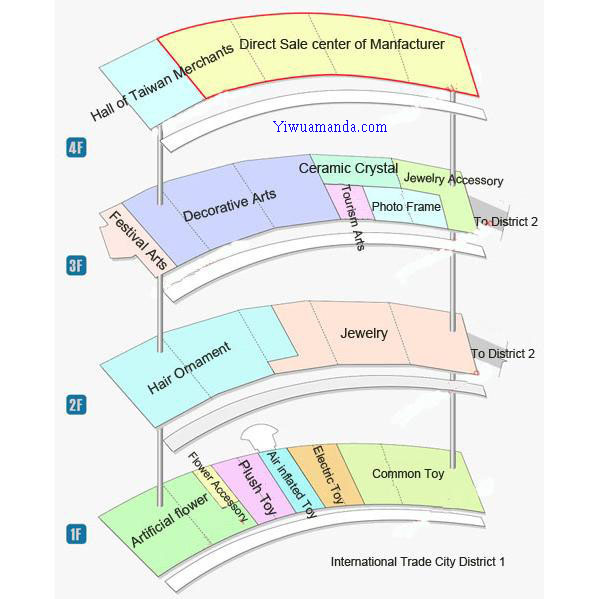 The 1st floor deals inartifical flowers and toys, the 2nd floor for jewelryand hair ornament; arts & crafts and jewelry accessories on the 3rd floor, manufacturer outlet center on the 4th floor and sourcing center of foreign trade companies in the east subsidiary building.It divide to A,B,C,D and E sections. The International Trade City District 1 is a commodity trading market integrating modernization, internationalization and informatization. It hsas realized several transformations since it was put into service: firstly, it has transformed from the traditional trade to modern business mode which is mainly of commodity exhibition, negotiation, order fulfillment and E-commerce. The International Trade City is honored as “Expo that Never Drop the curtain” by foreign customers; secondly, it has realized the transformation that foreign trade exceeds domestic trade, the daily customers reach 40,000 and 5,000 of which are foreign customers, the export rate of commodities is above 60%, more than 95% of the booths accept foreign trade business and the commodities are exported to over 200 countries and regions; thirdly, it has realized the intellectualization of hardware facilities in the market. The whole market has easy accessibility of crowd passage, logistics service and information. It is equipped with 37 elevators and escalators, the automobiles have access from floor 2-4 and over 13,000 broadband interfaces in the market enable every booth to realize online business and consult information on the net. The Yiwu International Trade City 1 is an appointed shopping & tourism spot by Zhejiang Tourist Bureau and is titled the first “Five-star Market” of Zhejiang province by Provincial Industrial & Commercial Bureau. In 2005, the market passed the assessment of national AAAA Tourist Attraction.